Today’s retailers and manufacturers face their fiercest competition ever. As a result, both parties are feeling the squeeze, including demands for growth, improved margins, better terms, greater investment, increased capacity, and more. In an environment this tense, if you’re not strategizing to maximize value, then chances are, you’re leaving opportunities on the table. As Simpactful’s Team has assessed this challenging marketplace, our most common observation is now more than ever, your ability to negotiate for joint value will disproportionately impact your bottom line. That’s why Simpactful is training business leaders to negotiate by focusing on maximizing value for both parties, in a way that will allow you to achieve goals, maximize value, but simultaneously build / maintain relationships. Simpactful’s training course, “Negotiating for Joint Value,” provides a clear path to better negotiation results. Our team brings years of hands on negotiation experience with both key retailers and top manufacturers and will teach in a very interactive way through highly customized scenarios, skill practices, and simulations. Recognize the psychological aspects of negotiating, and how to manage them to your benefit. 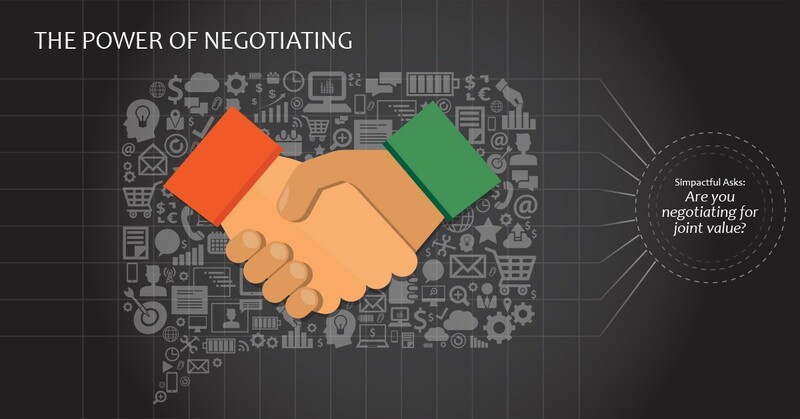 Learn the ins and outs of four core negotiation approaches and how each can impact your business relationships in both the short and long term. Realize the significance of power in a negotiation, and understand how to manipulate the variables that determine power levels. What are the common characteristics of the best negotiators? Find out. Then become aware of your personal strengths and opportunities, and strategize accordingly. Learn to recognize common tactics used by key retailers. Then strategize around your own tactics and neutralize impact of your opposing party’s tactics. Most progress is won before you even begin – at the preparation table versus the negotiation table. Get access to our Negotiation Planning Guide so that you can prepare comprehensively for upcoming negotiations. Ready to make the most of your next negotiation? To learn more about this training course and overall capabilities to enable Manufacturers and Retailers to win, please email us at contact@simpactful.com or call 925-234-6394. "Simpactful has a really strong organization punctuated by some amazing individuals"